Taken from James Ellroy’s amazon.com page. No copyright infringement intended. 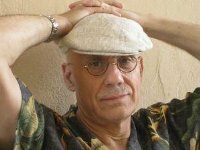 If you’re a regular reader of this blog, the chances are you read the work of James Ellroy, and if you’re an Ellroy fan, I have a question – have you heard the name Randy Rice? I began my PhD on Ellroy by studying the hundreds of interviews Ellroy has given over the course of his career. One name popped up regularly in Ellroy’s recollections: Randy Rice. Rice was Ellroy’s closest friend during his years of drug and alcohol abuse. They shared many of the same vices, but when Rice got sober this gave Ellroy the confidence to follow his lead. Despite this, I didn’t think Rice warranted much attention in a study of Ellroy. He appeared at first to be merely a footnote in Ellroy’s life. It was only when I was editing Conversations with James Ellroy (2012) that I began to think otherwise. Rice seems to be a ubiquitous presence in Ellroy’s life in the 1970s, and an allusive presence in his early novels, and in this blogpost I’m going to examine the level of his influence on Ellroy. However, I should confess what I don’t know about Rice. I don’t know his date of birth or what he did for a living (I would guess, like Ellroy, he was unemployed for long periods of time). I’ve not been able to find a photograph, so I’ve no idea what he looked like. All I know for sure is that he was Ellroy’s friend, and this is, I believe, what’s important. Interviewer Paul Duncan described Rice as a ‘childhood friend’ of Ellroy’s, and this French website puts the year they met as 1961. In his second memoir, The Hilliker Curse (2010), Rice pops up briefly when Ellroy describes how he once sold his own blood plasma, got drunk on the money with Rice at the Pacific Palisades, and then woke up days later in bed with a woman who ‘weighed three bills easy’. To make matters more surreal, he discovered he was in San Francisco and had absolutely no recollection how he had got there. In an interview with Martin Kihn, Ellroy describes how he was living on the rooftop of Rice’s apartment building ‘at Pico and Robertson in West Los Angeles’ in 1975 when he began screaming uncontrollably and suffering hallucinations. Rice called an ambulance and, by doing so, may well have saved Ellroy’s life. A doctor diagnosed Ellroy has having post-alcoholic brain syndrome, ironically a consequence of the sobriety Rice had urged him to pursue. In the documentary Feast of Death (2001), Ellroy describes how he invented ‘Dog Humour’ with Rice. Ellroy fans will recognise Dog Humour from his interviews, book readings and even sections of his fiction. It has to be seen to be believed, but I would describe it as Ellroy developing his own schtick by being deliberately provocative and offensive in every conceivable way: sexually, politically, racially. Once every possible taboo has been broken the reader or audience will realise Ellroy is being tongue-in-cheek, relax and enjoy the humour on its own level. To be clear, I enjoy Dog Humor, and I don’t think for a moment that Ellroy is a bigot, although I can understand why some people have jumped to that conclusion. Walter has taken fantasy into the dimension of genius. His is pure verbal fantasy: Walter has never written, filmed, or composed anything. Nonetheless, in his perpetual T-Bird haze he can transform his wino fantasies into insights and parables that touch at the quick of life. On his good days, that is. On his bad ones he can sound like a high school kid wired up on bad speed. I hoped he was on today, for I was exhilarated myself, and felt the need of his stimulus: the power of a Walter epigram can clarify the most puzzling day. Here’s the genesis of Danny Upshaw: my buddy Randy Rice and I went to see the William Friedkin movie Cruising. So he’s a young cop, presumably heterosexual, played by Al Pacino, and there’s gay killings in Greenwich Village circa 1980, pre-AIDS and all that. It may be over-reaching, but as Rice was probably as loquacious as Ellroy judging by their love of Dog Humour, I wonder if they hammered out some of the plot of The Big Nowhere together after viewing Cruising. In his excellent study of Ellroy, James Ellroy: A Companion to the Mystery Fiction (2014), Jim Mancall notes that in Suicide Hill (1986), the charismatic but self-destructive Duane Rice, a car thief who is the anti-hero of the novel, name is an amalgamation of two friends of Ellroy, Duane Tucker and Randy Rice. Tucker, incidentally, is another intriguing figure from Ellroy’s early career. In Feast of Death, Ellroy says of Rice ‘Sometimes I miss him’, implying that he either lost contact with Rice or he passed away. Skim-reading Ellroy’s first memoir My Dark Places (1996) while researching this post, I was surprised that I couldn’t find a mention of Rice. Then it dawned on me that Rice is referred to simply as Lloyd in the book. Why is this? Possibly because Ellroy has always followed a simple rule regarding libel. Put simply, you can’t libel the dead. Ellroy was once sued by ex-convict Albert Teitelbaum, whom he had used as a character in a short story after presuming, wrongly, that Teitelbaum had died years ago. If Randy Rice was still alive in 1996, Ellroy may have felt that his portrayal of him, sharing the same vices during their drug and alcohol years was too legally risky and a false name would have to be used instead. This is speculation on my part, and it doesn’t sit well with the fact that Ellroy clearly admired Rice and appreciated his friendship. If any readers have additional information about Ellroy’s friendship with Randy Rice, I would like to hear it. Of course, I don’t want to intrude on a man’s privacy, even if he is dead, but I think Rice’s immensely positive influence on Ellroy’s life and writing has been understated for too long. Very intriguing post, thanks for sharing. I’ve just recently finished ‘Brown’s Requiem’, and enjoyed identifying the autobiographical elements. Without knowing about Rice until I read this piece, those elements of the novel which related to Fritz Brown’s childhood felt very real and true to life. Glad you liked the post. Yes, Brown’s Requiem is a terrific novel that is easy to overlook in the wake of Ellroy’s later LA Quartet novels. Its flaws include a number of stylistic lapses and cheesy lines, but it reads as a very emotionally honest and raw book, and is all the better for it. Yeah, I really enjoyed it. Thought Fritz Brown got let off lightly at the end – Ellroy gets much more harsh with his protagonists in later books! I wonder if ‘Randy Rice’ is a (nicely alliterative) pseudonym? It could be. Ellroy likes alliteration, as those Hush-Hush articles show. My dad used to pal around with Randy Rice when he and James Ellroy (“Lee”) lived in Venice. This is 1980, 1981. They were free, white and thirty-ish. Brothers in sobriety. Rice and Ellroy were renting neighboring bungalows on the boardwalk. While Ellroy spent his days looping the golf courses at Hillcrest, Brentwood, and Bel-Air Country Club, Rice would go to thrift stores and comb for rare books to buy and sell back to used bookstores. My dad remembers Rice having the outline to a novel he wanted to write entirely mapped out on his wall. He describes Rice as a kind, intelligent, overweight man, forever in flip-flops, red-faced from (?) Methadone and/or Hepatitis C treatments. In other words, he was physically and aesthetically the exact opposite of Ellroy. No idea what happened to him, though. After Ellroy published “Brown’s Requiem” and moved to New York, my dad lost contact with them both; I suspect the same thing happened between Rice and Ellroy. Al, thank you so much for this information. This is the most detailed description of Rice I have come across outside of Ellroy’s own writing. It’s a shame that novel Rice was planning never saw publication, I assume. Rice was certainly a very creative man and had an immensely positive influence on Ellroy.